Falcon 1 is a mostly reusable, 2-stage, liquid oxygen and rocket-grade kerosene-powered launch vehicle. The 2-stage liquid-fuelled rocket booster had a re-usable first stage that was recovered from the sea after use and could be prepared for the next launch within one month. First launch of Falcon I was contracted for early 2004, carrying a US Defense Department communications satellite. SpaceX also had agreements in principle to perform 2 other Falcon 1 launches in the late 2004 to early 2005 timeframe. 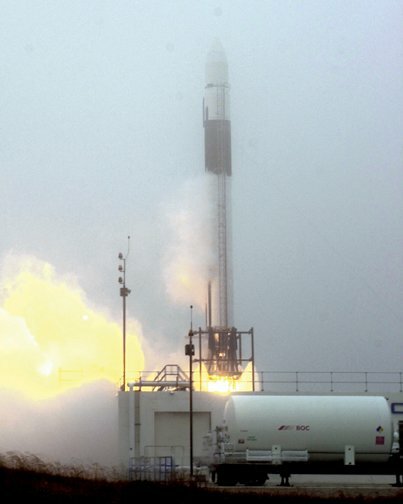 A successful ground test of the Falcon I launch vehicle at Vandenberg 27 May 2005 put the Air Force one step closer toward its goal of acquiring a less expensive means for lifting payloads into space. The full launch wet dress rehearsal marked the completion of the largest milestone remaining before launch. The test run included a countdown sequence and ignition of the main engine. It exercised Falcon vehicle systems and range safety interfaces to ensure optimal operations during the upcoming launch campaign. The first launch of Falcon 1 ended in failure 24 March 2006 over the Pacific Ocean shortly after liftoff. Space enthusiasts watched the launch through a live Internet telecast, but moments later the picture went dead, and the company later said it lost the space vehicle. A spokeswoman said it was not initially clear what went wrong. Falcon 1's maiden flight, conducted 2 years later than originally planned, carried the US Defense Department's TacSat-1 satellite. This was the first of 3 scheduled Falcon 1 launches for the Space and Missile Systems Center at Los Angeles AFB. The second launch attempt with a 2-stage Falcon 1 rocket from its Pacific island launch site began at 9:10 p.m. EDT (0110 GMT) on 21 March 2007, but suffered a roll control malfunction 186 miles (300 kilometers) above Earth before completing its flight plan. On 2 August 2008 the third SpaceX launch attempt failed when the first stage failed to separate after having initially performed flawlessly. The Falcon carried 3 small satellites: Trailblazer, a Department of Defense quick-turnaround demonstration; NASA's PRESat, a small automated laboratory; and NanoSail-D, a NASA solar sail test. Subsequently, Elon Musk, founder of SpaceX, stated that a fourth launch was "almost ready for flight." Musk stated that "the fourth flight, currently scheduled to take place in the fourth quarter of the year, and fifth flights are being prepared, and that he has given the go-ahead 'to begin fabrication of flight 6." The following day, a company spokesperson also stated "that The Founders Fund, a private-equity group, has now agreed to invest $20 million in return for a relatively small minority stake." According to the company, "If the rocket's technical problems persist, [NASA's] carefully calibrated plans" to deliver cargo to the International Space Station "could fall apart, prompting Congress and government space officials to re-evaluate SpaceX's ability to play a major role in achieving those goals." On 28 September 2008, the Falcon 1 became the first privately developed liquid fuel rocket to orbit earth. This flight, the fourth flight of the Falcon 1, achieved liftoff at 4:15 p.m. (PDT) / 23:15 (UTC) from the SpaceX launch site on Omelek Island. It carried a 364 pound payload simulator into orbit. In 2010, SpaceX discontinued the Falcon 1 in favor of the Falcon 1e, an enhanced version of the rocket. The new version featured a redesigned nose fairing and improved first stage engine, the Merlin 1C.